Greta is a 2018 psychological thriller film directed by Neil Jordan and co-written by Ray Wright and Jordan. The film stars Isabelle Huppert, Chloë Grace Moretz, Maika Monroe, Colm Feore, and Stephen Rea, and follows a young woman as she befriends a lonely widow who becomes disturbingly obsessed with her. Greta held its world premiere at the Toronto International Film Festival on 6 September 2018. It was theatrically released on 1 March 2019 in the United States, by Focus Features. The film has grossed over $12 million worldwide and received mixed reviews from critics. Frances McCullen (Chloë Grace Moretz) is a young American waitress living a quiet life in New York City with her friend and roommate Erica Penn (Maika Monroe). Having recently lost her mother to cancer, Frances maintains a strained relationship with her workaholic father Chris (Colm Feore). While on the subway, Frances finds a handbag belonging to a supposedly French woman named Greta Hideg (Isabelle Huppert), a piano teacher who gives her students private lessons. Finding her address, Frances returns the handbag to Greta. After accepting to have coffee, Greta tells Frances she is a widow whose daughter is studying in France. Frances begins to spend time with Greta to keep her company. One night while at her house preparing dinner, Frances finds handbags identical to the one she found on the subway. The bags have names and phone numbers of people Greta knows, including Frances. Disturbed, Frances decides to cut ties with Greta. Soon after, Greta begins to stalk Frances, texting and calling her repeatedly. On certain occasions, Greta is also seen standing outside of the restaurant Frances works at. When Frances calls the police, she is told to ignore her as she is on public grounds. Greta even stalks Erica, sending Frances pictures of her out and about. Eventually, Frances coldly tells Greta not to harass her or Erica after Greta shows up to their apartment. Greta later shows up at Frances’ shift, insulting her and causing a scene before she is thrown out and taken to the hospital. Frances and Erica pursue a restraining order, but are told that it could take months to get a hearing. Erica tells Chris about Greta, and Chris tells Frances to cut Greta out of her life. Meanwhile, Frances finds out that Greta was released from the hospital, and that Greta's daughter actually took her own life and had never been to France. Frances is torn to either go away with her father or leave the country with Erica, but Frances does not want to have to leave because of Greta’s behavior. Erica suggests lying to Greta and saying she is leaving to address her own issues, which Frances does. The next day, Frances is kidnapped by Greta and brought to her home where she is placed in a large wooden chest in a secret room. While there, Greta uses Frances' phone to text Erica and Chris to tell each of them that Frances was with the other using old photos found on her phone. When Frances is released from the chest, she finds articles of clothing and IDs from the other girls listed on the handbags. While Erica and Chris look for Frances, she has been kept with Greta for an indefinite amount of time, forced to learn piano and French. During a lesson, Frances cuts off Greta's finger with a cookie cutter, and uses the rolling pin she is holding to knock Greta unconscious. Frances tries to escape, heading into the basement only to find one of Greta's victims in a body bag, still alive. Greta then reemerges and wraps a bag around Frances' head until she passes out. Chris hires Brian Cody (Stephen Rea), an Irish private investigator who is a friend of the family. Brian explains to Chris that Greta was a nurse who was let go for abusing sleeping medication and further explains that Greta was supposed to be in Hungary, where she is actually from. Brian visits the home to meet with Greta. Frances, gagged and bound to a bed, attempts to get his attention by thrashing her body and causing the metronome on top of the piano to activate. Brian eventually figures out that there is a secret room behind the piano, despite Greta attempting to block out the noise with music. However, he is tranquilized and eventually shot by Greta with his own gun. An indefinite amount of time passes before Greta leaves another handbag for an unsuspecting victim on the subway. A woman brings the handbag to Greta's home and is allowed inside. Frances attempts to get the woman's attention, but is unsuccessful. After Greta drinks her coffee, she realises it’s been spiked and passes out as a result. The woman takes off her wig and reveals herself as Erica. Erica finds and rescues Frances before they place Greta’s unconscious body in the chest and leave. The film ends as Greta wakes up inside the chest and starts banging on it, causing the makeshift lock to move. Isabelle Huppert as Greta Hideg, an obsessive piano teacher and former nurse. Chloë Grace Moretz as Frances McCullen, a young waitress. Maika Monroe as Erica Penn, a friend and roommate of Frances. Colm Feore as Chris McCullen, Frances' workaholic father. Stephen Rea as Brian Cody, an Irish private investigator. In May 2017, it was announced that Isabelle Huppert and Chloë Grace Moretz had signed to star in the film, then titled The Widow. In August 2017, Maika Monroe joined the cast. In September 2017, Stephen Rea, Colm Feore, and Zawe Ashton were added as well. The film was produced by Metropolitan Films in cooperation with Lawrence Bender Films, Little Wave Productions and Sidney Kimmel Entertainment. It also received an €650,000 production grant from the Irish Film Board. Principal photography took place in and around Dublin, beginning in October 2017. It was also filmed on location in Toronto and New York City. The film had its world premiere at the Toronto International Film Festival on 6 September 2018. Shortly after, Focus Features acquired distribution rights to the film for $4 million, though some sources believed the number was as high as $6 million. It was theatrically released on 1 March 2019 in the United States. In the United States and Canada, Greta was released alongside A Madea Family Funeral, and was projected to gross around $6 million from 2,000 theaters in its opening weekend. It made $1.6 million on its first day, including $350,000 from Thursday night previews. It went on to debut to $4.6 million, finishing eighth at the box office. On review aggregator website Rotten Tomatoes, the film holds an approval rating of 54% based on 183 reviews, with an average rating of 5.56/10. The website's critical consensus reads, "A bonkers B movie that's elevated considerably by its A-list talent, Greta dives headlong into camp and stays afloat thanks to a pair of powerful lead performances." On Metacritic, the film has a weighted average score of 53 out of 100, based on 38 critics, indicating "mixed or average reviews". Audiences polled by CinemaScore gave the film an average grade of "C" on an A+ to F scale, while those at PostTrak gave it an average 2 out of 5 stars and a 34% "definite recommend". ^ "Greta". Toronto International Film Festival. Retrieved 21 August 2018. 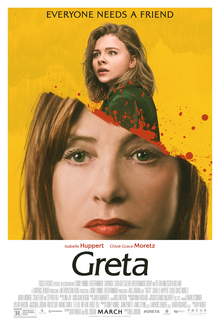 ^ "Greta (2019)". Box Office Mojo. Retrieved 27 March 2019. ^ "Greta (2019)". The Numbers. Retrieved 14 April 2019. ^ "Cannes: Isabelle Huppert, Chloe Grace Moretz to Star in Thriller 'The Widow' (Exclusive)". The Hollywood Reporter. Retrieved 30 March 2018. ^ Jr, Mike Fleming (1 August 2017). "Maika Monroe Set For Neil Jordan's 'The Widow'". Deadline Hollywood. Retrieved 30 March 2018. ^ McNary, Dave (13 September 2017). "Film News Roundup: 30WEST Buys 'Beast'; 'Stephen Rea, Colm Feore Join Chloe Grace Moretz Thriller". Variety. Retrieved 30 March 2018. ^ Abbatescianni, Davide (22 November 2017). "Greta filming in Manhattan". Cineuropa. Retrieved 9 December 2018. ^ "Neil Jordan's 'The Widow' with Chloe Grace Moretz receives Irish Film Board funding". Screen Daily. Retrieved 24 March 2018. ^ Vlessing, Etan (21 August 2018). "Toronto: Natalie Portman's 'Vox Lux,' Chloe Grace Moretz's 'Greta' Join Festival Lineup". The Hollywood Reporter. Retrieved 21 August 2018. ^ Fleming Jr, Mike (8 September 2018). "Focus Features Closes $6 Million Deal For Neil Jordan Thriller 'Greta:' Toronto". Deadline Hollywood. Retrieved 8 September 2018. ^ a b c D'Alessandro, Anthony (3 March 2019). "'Dragon 3' Keeps The Fire Burning At No. 1 With $30M Second Weekend; 'Madea' Mints $27M". Deadline Hollywood. Retrieved 3 March 2019. ^ Fuster, Jeremy (26 February 2019). "'Will 'A Madea Family Funeral' Bury Tyler Perry's Franchise at the Box Office?". TheWrap. Retrieved 27 February 2019. ^ "Greta (2019)". Rotten Tomatoes. Retrieved 18 March 2019. ^ "Greta Reviews". Metacritic. Retrieved 5 March 2019. This page was last edited on 21 April 2019, at 02:24 (UTC).